Advanced Special Price Editing for a SKU – Pacific Amber Technologies Inc.
5. You can create more advanced pricing rules using the button, which will open a popup list of commonly used discount rules, as well as the option for a blank rule. 6. Once you have created your pricing rule you can edit it using the tab to bring up a list of fields to change the pricing values and rule conditions. 7. 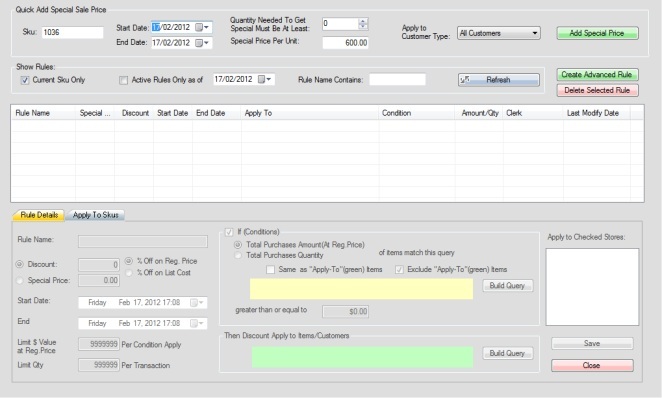 Select Create Advanced Rule to open the advanced pricing rule editor. Step 1: Once you create a new rule, it will appear in this list. Select it to edit the settings. Step 2: This section allows you to name the rule, designate whether the discount is a percentage or set value, the date range for the rule, designate a limit for discount value, limit the quantity sold per transaction, and whether to only discount the highest priced item first. Step 3: You can apply "If conditions" using the query builder to change the special price for certain scenarios. For example you can create a rule that states "If Total Purchase Amount = $5.00 or greater, then give extra 10% discount." Step 4: This section applies the special price to a designated choice of products using the query builder. Step 5: Here you can apply the rule(s) to all or some of your stores and store locations. Step 6: Once you are satisfied with your new pricing rules, use the button in the bottom right corner to save your changes, and exit the Discount Rule window using the button below it.